Briefly: Lottie’s boyfriend is about to propose, she just knows it. And, because she thinks too much (but not deeply), she is completely thrown off guard when he asks her…what they should do with his air miles. A trip somewhere, but not down the aisle. Hurt, Lottie breaks up with Richard. Once home, she remembers that a mysterious “Ben” had called her at work that week. Could it be? Is it possible that it’s her old flame from that amazing summer in Greece? So Lottie calls Ben, and it is, indeed her Ben from the beach. Seems that they both have always looked back on that time as the best in their lives. So shouldn’t they just throw caution to the wind and get married? There’s only one request: that, since their previous relationship was quite sexually intense, this time around they will wait…until their wedding night. Didja Like It? : I really preferred Lottie’s sister, Fliss, and her relationship with Ben’s best friend, Lorcan (dontcha just want to eat up those names with clotted cream and marmalade?). Their problems and trials and issues they were facing were so much more real to me. Maybe that’s how it was supposed to be? Lottie and Ben as the comic foils, Fliss and Lorcan as the focal points. My main gripe, however, was that the demands made by Fliss of the hotelier in Greece were more than a little unbelievable. Anything Else to Mention? : About ten years ago, I couldn’t get enough of the writings of Ms. Kinsella and her set. Not that she’s changed; I must have. I used to love the mistakes, floundering, bluster and occasional forehead-slappingness of this genre. It just doesn’t hold the same level of appeal for me any more, I guess. To Read or Not To Read: If this is your cup of tea, then drink up. I must soften my critique a bit by saying that sometimes you just need to read a book that’s well-written, yes, but that cleans all of the fantasy and paranormal and dystopian out of your brain. Something where you know that through all of the bickering, demi-hostility, misunderstandings and bad choices that the sparring couple will end up together in the end. And it will be right. 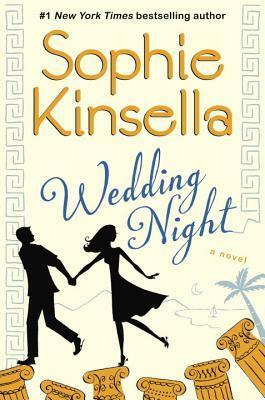 Wedding Night by Sophie Kinsella was published April 23, 2013 by The Dial Press. Ink and Page picked this book up from the library so no one had a choice about whether it was reviewed. Previous PostWeekend Reads 9.6.2013Next Post‘Crash and Burn’ Giveaway Results!